A place to catalog projects I am working on and finished with. Christmas is soon so I am making presents for my boys. Here is the first. I am thinking of making a car for him to drive around in. He seems like he needs a car even though he does have rocket shoes. Use an f hook throughout. Rnd 10-16: sc around (45) sl st last st, cut off thread leave a tail to sew. Do same as for head but stop at round 9. cut thread. Cut thread and leave tail to sew on head. Cut thread and leave a tail to sew bottom on. Same as for bottom of head. do rounds 1-9 from head. Rnd 5-9: sc around (24) cut thread and leave tail for sewing. sl st last st and cut thread and leave tail for sewing. Rnd 4: 1 sc, sl st next st. cut thread. Rnd 2: sl st. cut thread, leave a tail for sewing. Sew the bobin to the head. Put eyes in the head and stuff the head lightly. Sew bottom onto the head. Sew buttons on the body. Sew arms on the body. Squash the top of the body down and tack it in place. Sew rounded end of neck to the body. Stuff neck and sew head on. Lightly stuff grey feet. Sew in red bottoms. Stretch blue feet over grey feet and tack them to it. Sew feet to grey bottom of the body. Stuff body. Sew bottom of the body to the body. I inset the bottom a few rows so it sinks in a bit. If there are any problems with the pattern please let me know through the comments so I can fix them. Just too sweet! I will have to make this for my son! First, thank you so much for posting this. 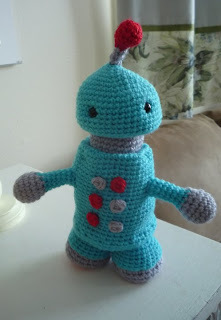 It's the perfect pattern to make for my best friend's robot-themed nursery. What did you use for the eyes? Are they some kind of button? For the ARMS section, RND 7 decreases and then it says switch to blue and continues with RND 9. Is RND 8 supposed to decrease as well or should that be 8-14 instead of 9-15? Thank you for noticing the typo it should be 8-14. I will fix it right away. I hope you enjoy the robot. I made this and I followed the directions to the best of my ability, however, this is like the second project I've ever made, haha. Mine came out slightly silly looking. How do you pin down the extra yarn? I couldn't get that for the life of me! He still looks really cute. 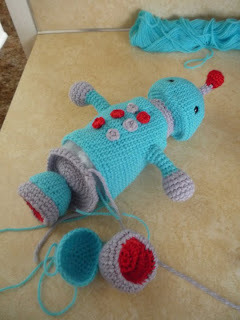 I suggest you tuck the stuffing up and tack the two sides together with yarn by grabbing the backside of your stitches. That should work with his bottom. With his neck you could try the same thing, but mine likes to pop out a little on the neck too. Best of luck and thank you so much for showing me. I love to see finished pieces from my patterns. 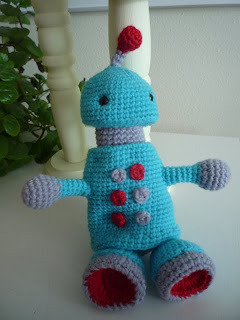 My wife just made a version of this robot for her nephew. Cute! Thank you so much for sharing your pattern! 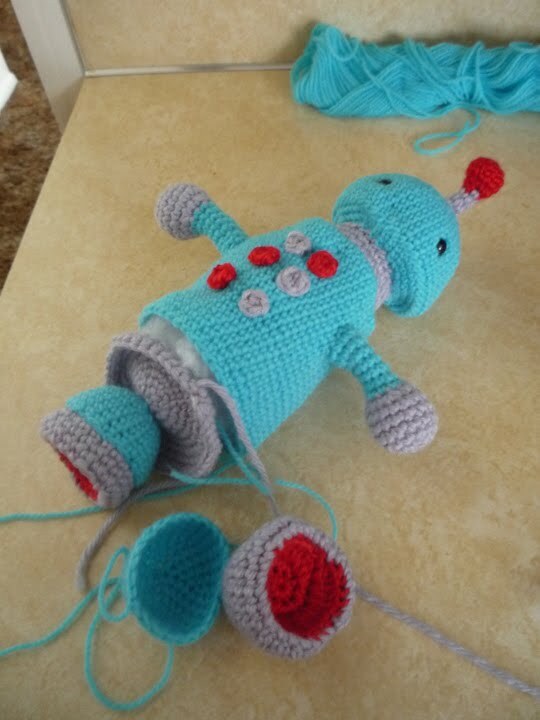 My son is absolutely obsessed with robots. I made this for him for his 7th birthday just yesterday. The look on his face when he unwrapped it made my heart melt <3 The only thing I modified was the buttons. Thank you! He's adorable. Thank you for sharing. What size safety eye did you use?